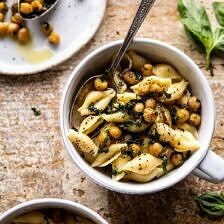 Instant Pot Cacio e Pepe with Crispy Garlic Basil Chickpeas. 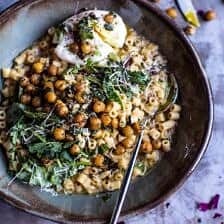 Monday night Instant Pot Cacio e Pepe with Crispy Garlic Basil Chickpeas. Looking for a dinner that can be made in 15 minutes, and with pantry staple ingredients? This is it. Add pasta shells, butter, pepper, and water to the instant pot, cook 3 minutes, stir in cheese, and you’re ready to eat. I like to call this Easy Adult Mac and Cheese, with crispy chickpeas on top. It’s the simplest, but also so delicious…the perfect weeknight pasta. When Monday starts with pasta, you know it’s going to be a good week. But then, my requirements may be slightly different from yours, because around here, a healthy diet does include pasta. What can I say, my mom taught me well. Anyway, happy Monday guys! The weekend was great, but I’m that odd person that lives for a super productive Monday. After a weekend spent catching up on “house” things…bathroom cleaning, pantry organizing, and finally taking down the lingering Christmas decorations. I’m honestly happy to be back at work and doing the things I love. When your weekends are spent voluntarily doing house “chores”, you know you’re no longer a kid. It’s not a bad thing, but gone are the days of sleeping in, chocolate chip pancakes at 2pm, and TV watching for a good part of the day. OK. Moving along. Let me tell you about this Instant Pot cacio e pepe. First things first, I shared a more classic recipe for cacio e pepe last year. It’s since become a reader favorite, it’s quick, it’s easy, and it is delicious. I’m going to be honest, when I first made this pasta I didn’t even realize I was making cacio e pepe. I was just throwing together a quick meal with some pantry staple items I had on hand. I wasn’t really thinking beyond wanting a simple bowl of cheesy pasta. Turns out I ended up making the instant pot version of cacio e pepe, complete with crispy chickpeas on top. And it turned out so good. For those of you who aren’t familiar with cacio e pepe, it means cheese and pepper in Italian. It’s like Italy’s version of mac and cheese, but simpler, and in my opinion better. Well, it depends what kind of mood you’re in. It’s a lighter version of cheesy pasta that doesn’t feel as indulgent as a bowl of mac and cheese. Yet, it’s still pasta, it’s still creamy, and it’s still cheesy. When looking at the recipe you might think it seems basic, that’s because it is basic. 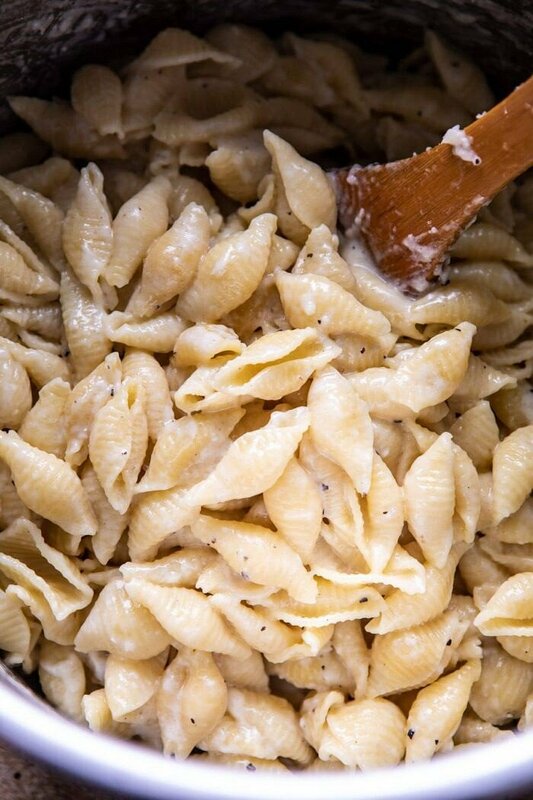 BUT with good pasta, a little butter, fresh black pepper, and really good cheese, pasta can be basic and perfect. And with this cacio e pepe, I added a topping of garlicy, basily crispy chickpeas. 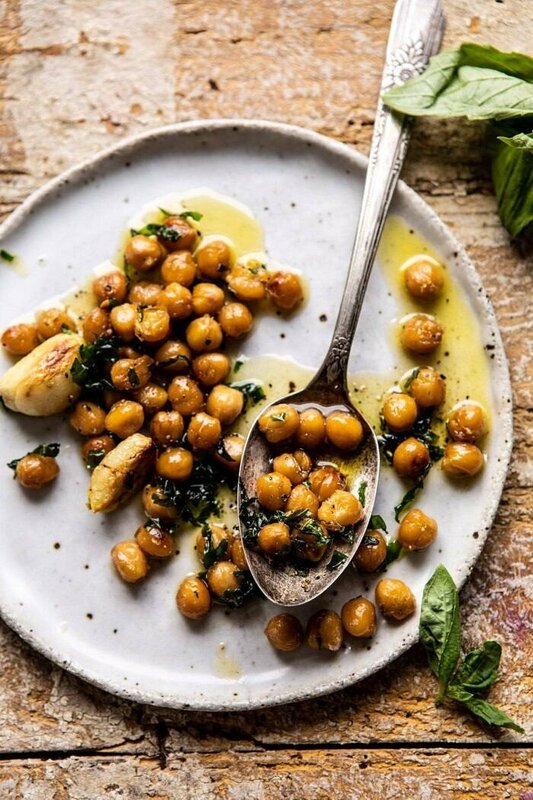 The crunchy chickpeas add not only a healthy protein, but also a nice texture. And the very best part? It’s made in the Instant Pot, and in just 3 minutes time. Yes, 3 minutes on high pressure and then a little extra time for the instant pot to get up to pressure. Here’s how it works. Add the pasta, butter, black pepper, and about 4 cups of water to your instant pot. Set it for 3 minutes, then let it come to pressure and do its thing. While that’s happening, make the chickpeas, which are optional, but they really add something extra special to this cacio e pepe. And they’re easy. Just add olive oil, chickpeas, garlic, and basil to a skillet, and cook until crisp. They take no more than 5 minutes and are so delicious that they’re addicting (you might want to make extra!). Bonus? They’re healthy too! Once the chickpeas are done cooking, the instant pot will be finished as well. Once you’ve released the steam on the instant pot, stir in the cheeses and enjoy. It’s that simple, easy and quick. It’s very important to eat this right away, while the pasta is hot and cheesy. Of course the leftovers are great, but if you want that true creamy, buttery pasta, eat this as soon as it’s done cooking. 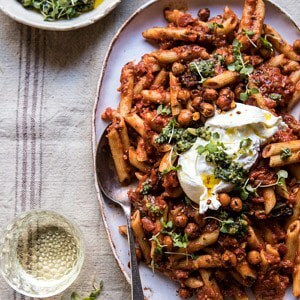 And be generous topping the pasta with the crispy chickpeas too. They’re kind of like a healthy breadcrumb, and like I said, they are addicting. I really could not think of a better recipe for a Monday. Serve this for dinner, and enjoy the leftovers for lunch. And always, always keep these pantry staple ingredients on hand. That way you can make this Instant Pot cacio e pepe whenever you need dinner on the table in 15 minutes or less…or simply when you need a good dish of cheesy pasta. You can’t go wrong with this recipe. 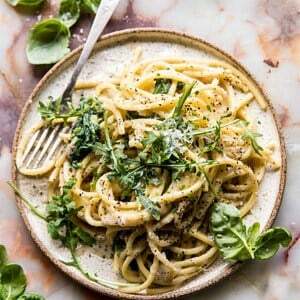 If you make thisInstant Pot Cacio e Pepe, be sure to leave a comment and/or give this recipe a rating! Above all, I love to hear from you guys and always do my best to respond to each and every comment. And of course, if you do make this recipe, don’t forget to also tag me on Instagram! Looking through the photos of recipes you all have made is my favorite! Add pasta shells, butter, pepper, and water to the instant pot, cook 3 minutes, stir in cheese, and you're ready to eat. I like to call this Easy Adult Mac and Cheese with crispy chickpeas on top. 1. 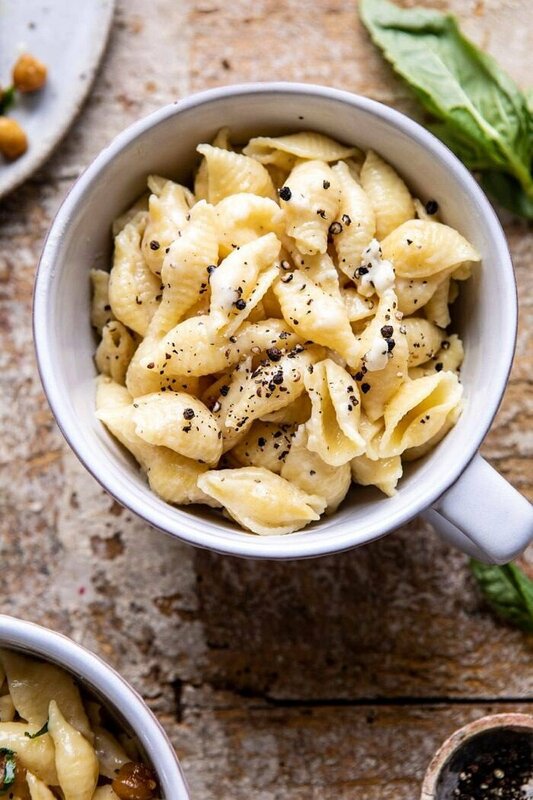 To the bowl of the instant pot, add the pasta, butter, black pepper, and 4 cups water. Cover, select the manual setting, and cook on high pressure for 3 minutes. 2. Once done cooking, use the quick release function and release the steam. Stir in the parmesan, and pecorino cheeses. Taste, adding salt, if needed. 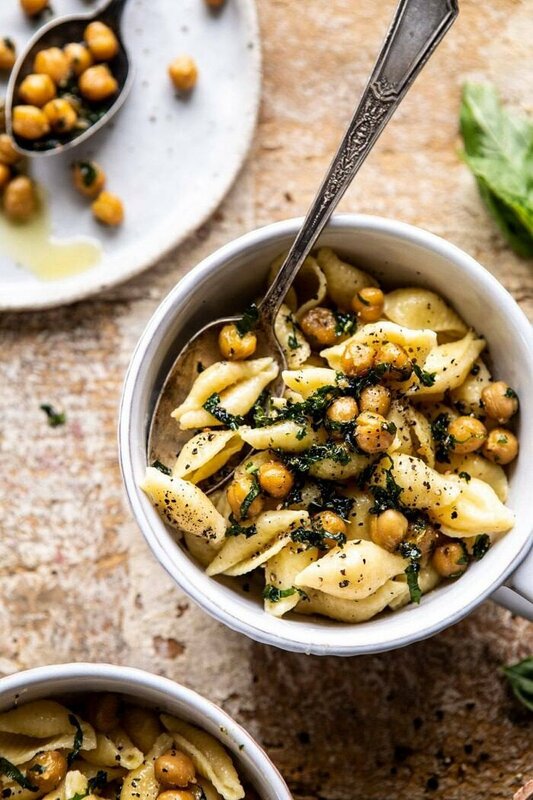 Serve immediately, topped with crispy chickpeas, if desired. 3. To make the chickpeas. Heat a large skillet over medium heat. Add the olive oil, chickpeas, garlic, and a pinch each of salt and pepper. Cook, stirring occasionally until the chickpeas are crisped all over, about 8-10 minutes. Stir in the basil, cook 30 seconds more. Remove from the heat and set aside. 1. In a large pot, combine the pasta, butter, black pepper, and 4 cups water. Bring to a boil over high heat. Boil for 7-8 minutes, stirring often until the the pasta is just al dente. If the pasta needed more time, add a splash of water and continue cooking 1-2 additional minutes. 2. Remove from the heat and stir in the parmesan, and pecorino cheeses. Taste, adding salt, if needed. 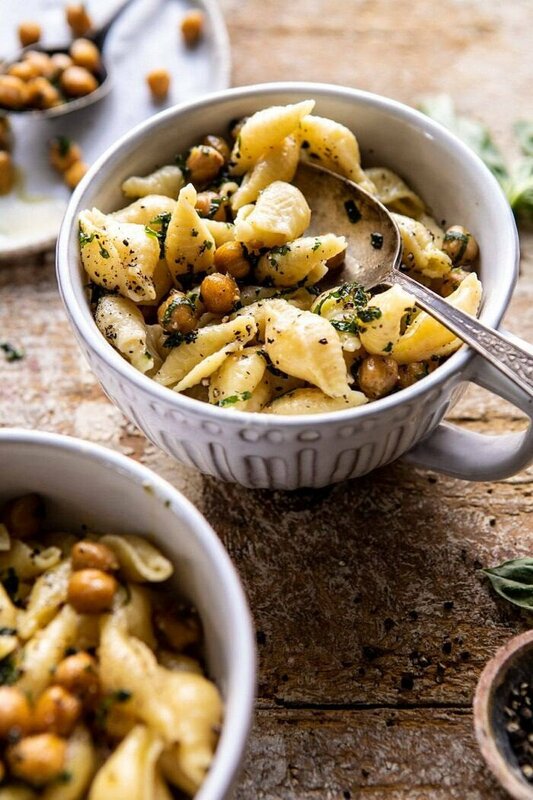 Serve immediately, topped with crispy chickpeas, if desired. 5 Ingredient Chocolate Dipped Peanut Butter Cookies. 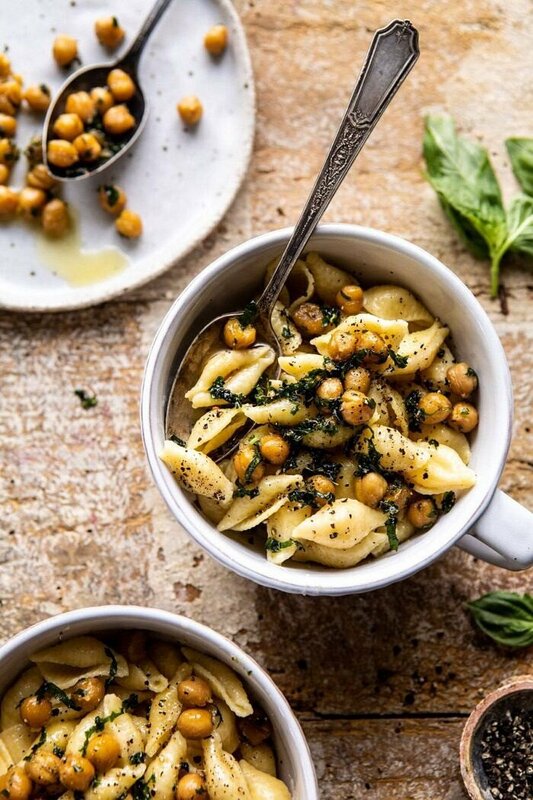 Quick + Simple Pasta “Risotto” with Herbed Roasted Chickpeas. The 25 Most Popular Recipes of 2018. Looks good. I did notice you did not list amount of servings. An approximate would be helpful, there are only two of us btw we love leftovers. Hi! I bought an instant pot after seeing some of your delicious-looking recipes!! Can’t wait to use it. I have a question since this mode of cooking is new to me: Will the pasta cook in just the butter? Thank you Tieghan!! Sounds delicious! But, call me a weirdo, I don’t have an instant pot and don’t really plan on getting one. Any adaptations you could suggest to make this with “regular” non-instant pots? Thanks! Can I make this on the stove? 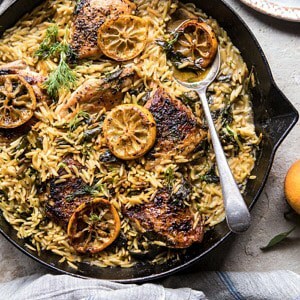 Any guidance on how to make this without an Instant Pot? Yes!! I hope you try this Sarah! LOVE this. Any pasta is a winner in my book, but this is so beautiful. Looking forward to making it! I hope you love this Colynn! Thank you! 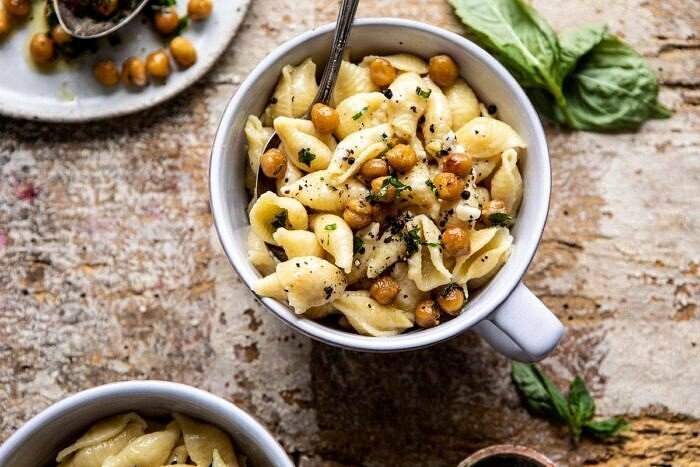 For those you don’t have an instant pot I would guess you could just cook the pasta on the stove following the directions o the pasta package, drain, add in the butter and cheeses,, stir together so the cheese melts, and then serve with the chickpeas on the side. This is almost exactly what joythebaker posted just the other day! So only 4 Cups of water for a whole pond of pasta with the stove top method? And no draining, just add the cheese once the noodles are done? Love the recipes, just a couple execution questions. Yum! I made this tonight and I’d call it a success. My pickup eaters loved the pasta, and I loved the chickpeas with it! I also enjoyed that it was a lighter Mac n cheese type dish, since my picky eaters eat that a lot. It was also super easy to make, which definitely makes it a winner. Thank you so much Shelby! I am so glad you all loved this recipe! First off, I’m a huge fan and I enjoy cooking your recipes so much. I am absolutely love your cookbook! I love that you are making insta pot recipes I honestly didn’t know what to cook in mine until you starting posting easy to follow recipes. I wanted to know the cooking time you would suggest for gluten free noodles? Or would the 3 minuets be fine. I don’t want to ruin it by making them mushy. Thanks a bunch. Hi. Any suggestions on how long to cook with the instant pot if we’re using homemade noodles? Hi Rebecca! I do not have any recipes for slow cooker mac and cheese yet, but I will look into it! Thanks! Made this tonight and it was FAST,EASY & delicious! Couldn’t get enough of the crispy chickpeas ! Keep these quick dinners coming please. This mama needs some help😉 I’m currently obsessed with all of your recipes and am going to cook straight through your cookbook until I’ve tried it all! Just ate a pecan pie cookie that I made yesterday for dessert. Thank you!!! Ah that is so amazing! I am so glad this turned out amazing for you and I hope you love every single recipe in the book! Thank you!! This was delicious!!! So yummy and so easy. I’m new to instant pot though, and when I released the pressure, butter, pepper, and steam were released rather than just steam. Any ideas what I did wrong? 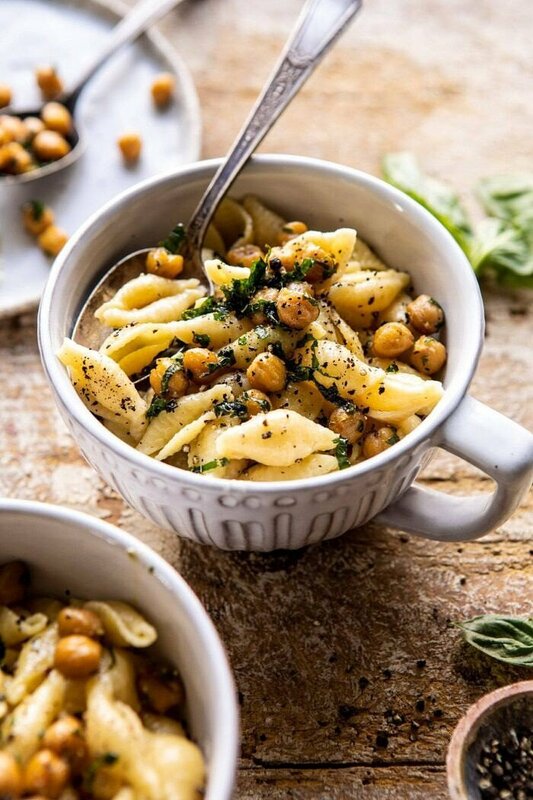 A cozy bowl of pasta sounds just perfect and I love the spicy chickpeas! I just made this and it is SOO good! And it’s the first thing I’ve made in my instant pot that I would actually call “instant”. So quick! Love the chickpeas for a little added protein. I will definitely make this again! Thank you so much Jodi! I am so glad you loved this recipe! Made this tonight. Very first meal in the new instant pot. Super delicious! I have a 3 quart and would probably half this next time as I had a starchy geiser at release. So good though. Thank you so much Jeanette! I am so glad you loved this recipe! How about whoke wheat pasta? Same cooking time? Another delicious HBH dinner. So quick I can make it after a long commute and still sit down to dinner at our usual time. Thanks Teigan, I prepare your recipes several nights per week; last night we had sheet pan cuban chicken and mango salsa bowls, also quick and delicious. I’m not sure how you do it every day, delicious food, beautiful pictures, charming writing. You have become my go-to for dinner ideas. I am so glad you loved this recipe, Mary! Thank you so much for making it! Let me start off by saying that I have loved your recipes so far and always have one of them on the menu each week. However, this recipe was very disappointing, especially since I love Cacio e Pepe and the thought of speeding up the process using an Instant Pot was great. I followed the instructions exactly and the results were not good. There was so much water left in the pot I thought I would definitely have to strain it, but after reading the comments I saw you said there was no need to strain. Upon adding the cheese it immediately congealed and formed into a mass that stuck to the bottom of the instant pot, it slipped right off the pasta. I kept stirring it to prevent it from burning and hoping it would coat the pasta, but no luck. I tried tasting it thinking that this amount of cheese, butter, and pepper should taste OK even if it doesn’t present well, unfortunately it was incredibly bland even after adding salt. The crispy chickpeas had flavor but were definitely not crispy, especially with only 5 minutes of cook time. I look forward to your other recipes, I just was disappointed with this one. Any recommendations for a cheese that’s not so sharp in flavor? I’m pregnant and don’t think I’ll be able to tolerate the Parmesan right now (thanks so much pregnancy symptoms😩). Do just looking for a cheese that will be milder in flavor. Thanks! Made this last week after work and it was a winner! Probably the fastest dinner ever. I added in some Gruyere because I had a little extra on hand that I didn’t want to go to waste. Super tasty! Hi there! I absolutely loved this recipe! Any tips on reheating my leftovers? I know cacio e pepe is very tricky! I see where you say *good* pasta, are there brands you recommend? I have a 3 qt instant pot and you must half (or halve?) recipes, food will geyser out the valve. This is a keeper!. So quick and tasty. I was worried my guys would complain since it was vegetarian but they both raved about it. Only thing I did differently was cook my Barilla pasta for 5 minutes. I used Barilla Casarecce instead of shells. They are also usually cooked for 9 minutes in the normal method. With 5 minutes it was al dente and there was almost zero water left, just enough to coat the cheesy sauce over it.